(1928 – 1995) Ray was the founder of Anglia Locksmiths in 1964 (previously known as Ray Ward & Sons). Born in Ely, he was a popular and respected member of the local community of Wisbech, including the Wisbech Swimming Club and Lions Club. Mark worked in the shop after leaving school, became a partner in 1995 and has now over 30 years experience in the locksmith trade. He is also a tutor at many of the annual locksmith shows across the country, and is a well known figure within the UK locksmith community. Specialities: Non-Destructive Openings, Safes & Key Programming. Born in Wisbech, Rosie moved from Anglian Water in 2002 to take over stock control and work behind the counter. (1945 – 2013) Born in Walpole Highway, Wendy worked in the shop from 1979 until her retirement in 2012. She raised money for the Alzheimer’s Society and Wisbech Lions Club. Born in Peterborough, Sara originally trained as a Legal Executive and moved to the company in 1997 to take over all admin & accounts, and then became a partner in 2014. David joined Anglia Locksmiths as a bench locksmith in 2002 and has since progressed to become a mobile locksmith. Specialities: uPVC Lock Repairs, Yale Expert. 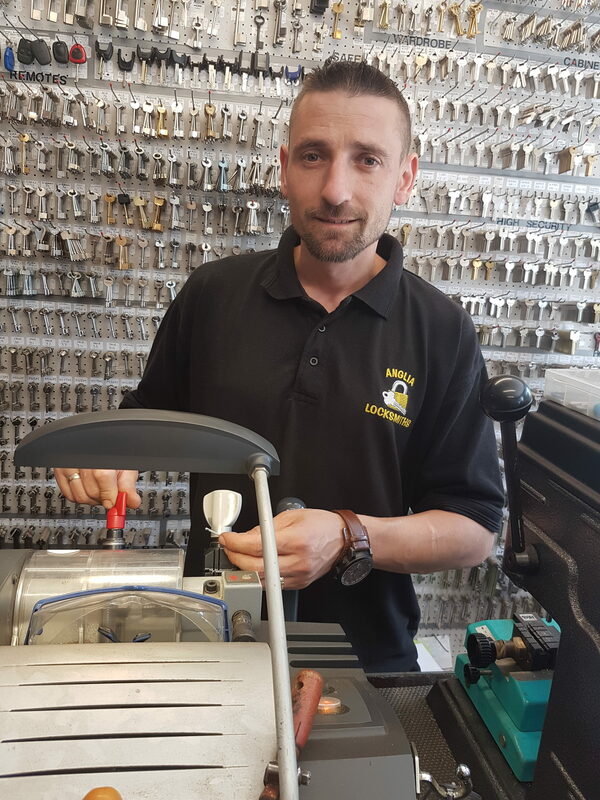 Mario was born in Kielce, Poland and joined the business in 2006 as he had previously worked for another locksmith company in Poland. He now has 17 years in the trade. Specialities: Car Transponder Keys, Antique Lock Restoration.